For as long as there have been civilized humans, there has been some form of China. It’s hard to say how old Chinese culture actually is, but it’s one of the oldest that still has a presence in the modern world. Legends claim that the earliest rulers in China were the Xia Dynasty, from 2100 to 1600 B.C., with Yu as the first emperor, but there is little proof that the dynasty actually existed. Below is a timeline of one of the great cradles of civilization. • 1600-1050 B.C. : Shang Dynasty - The earliest ruling dynasty of China to be established in recorded history, the Shang was headed by a tribal chief named Tan. The Shang era is marked by intellectual advances in astronomy and math. • 551–479 B.C. : Confucius - The teacher, politician and philosopher was raised in poverty by his mother. He entered politics in 501 B.C. as a town governor after gaining attention as a teacher, but in 498 B.C. lived in exile to escape political enemies. 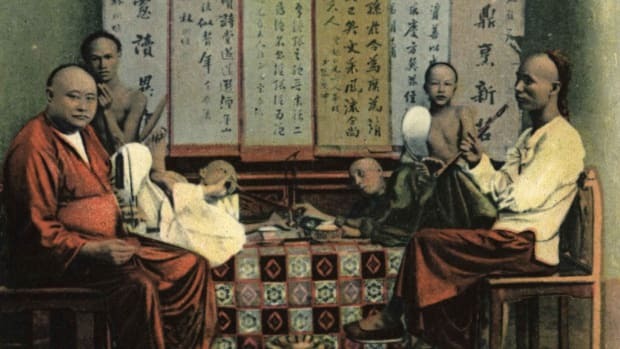 Returning to China around 483 B.C., Confucius devoted most of his time to teaching disciples his ideas (including, “Wheresoever you go, go with all your heart,” and “It does not matter how slowly you go so long as you do not stop.”) His ideas would become central to Chinese culture over time and endorsed by the government. • 221-206 B.C. : Qin Dynasty - The Qin Dynasty, from which China derives its name (Qin is pronounced “Chin”), was the first official empire in its history. The Qins standardized regional written scripts into a single national one, establishing an imperial academy to oversee the translated texts. The Qin Dynasty created the first Asian superhighway, the 500-mile Straight Road, along the Ziwu Mountain range, and began work on the Great Wall by expanding the northern border wall. Qin Emperor Ying Zheng created an elaborate underground complex at the foot of the Lishan Mountain, famously featuring 13,000 terracotta statues of warriors and horses. • 125 B.C. : The Silk Road - Following capture and escape during a mission for Emperor Wu, Zhang Qian returned after 13 years with a map of the ground he had covered. Reaching as far as Afghanistan, his maps were accurate and led to the international trade route the Silk Road.